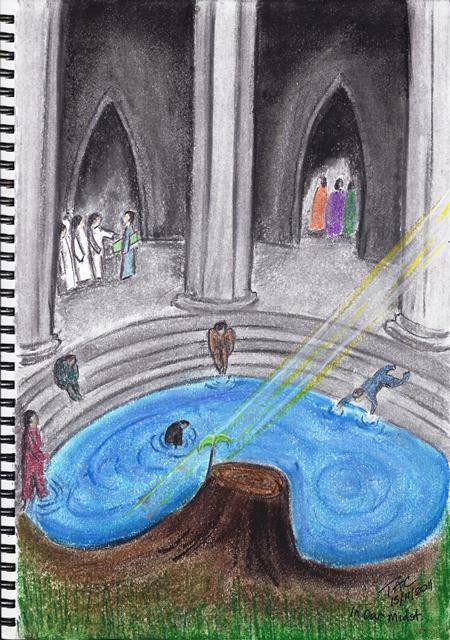 Two sentences from the Isaiah reading stood out for me; the first and the last: ‘A shoot will come up from the stump of Jesse’ and ‘For great in your midst is the Holy One of Israel’ and these two sentences acted as a commentary on the Gospel Story of the Man Healed by the Pool of Bethseda on the Sabbath day. I think this captures the essence of Michael’s address to some extent, at least the beginning of it. He began by speaking of the need for many people seeking healing and often looking for it in places such as the ‘spiritual fayres’ and he equated it with the people in the story seeking to be healed by the waters stirred by an angel (as the story is told in some translations). Jesus is there in the midst and perhaps this is a call for God’s people to go to where people gather to find healing and reveal Christ the healer to them. In the image I use the idea of the hiddeness of Christ in the ‘the shoot come up from the stump of Jesse’ as being ‘The Holy One in your midst’ as a commentary on the story of the man healed by Jesus and not knowing who it was who did it until Christ revealed himself to him.